Miniature Bellows ... Small in Size, but not Performance! Servometer® micro-miniature electrodeposited nickel bellows are extremely sensitive, seamless, and non-porous, and are ideal for dynamic applications where reliability and long life are critical requirements. They can be designed for a variety of stroke and pressure combinations and used as Aneroids, Micro-Hermetic Seals, Electrical Contacts and more. OD's from .020 to 18 inches available. Overmatch in weapon systems "means we have an advantage in every sense of the word ... it's much bigger than lethality," says Keith Jadus, acting director of the lethality portfolio for the Office of the Deputy Assistant Secretary of the Army for Research and Technology. This article looks at issues in developing technologies with extended range, precision, using direct energy, and more. Designing an injection-molded part with the proper draft, wall thicknesses, radii, and other considerations can be complicated, so when unique features like bayonets and gears are integrated into your geometry, another layer of complexity can arise. Proto Labs' Gus Breiland has some valuable advice for you if your part requires intricate features. Costing just pennies to make, new tiny radios-on-a-chip developed by a Stanford engineering team are designed to serve as controllers or sensors for the Internet of Things. Better yet, these chips do not need their own power sources. International automotive supplier Continental has developed a concept for an electric parking brake (EPB) for drum brakes. The novel solution is especially tailored to the lower-price automotive segment that, up until now, has had to make do with mechanical parking brakes built into the existing drum brake on the rear axle. 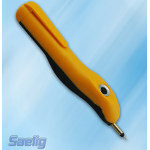 Saelig announces the Owon RDS1021 Wave Rambler, a new USB pen scope that packs all the features of a high-performance bench-top oscilloscope in a small, lightweight, and ergonomic probe that fits perfectly in the hand. Used with the included PC software, the RDS1021 Wave Rambler converts any laptop or desktop PC into a powerful oscilloscope without the need for additional probes or power supplies. By the end of September, NASA aerospace engineer Jason Budinoff is expected to complete the first imaging telescopes ever assembled almost exclusively from 3D-manufactured components. NFi Graphic Overlay Panels from Nameplates For Industry are custom made using the Texturite process, which starts with a hard-coat clear material such as Lexan or Mylar to provide clear, distortion-free front-panel graphic overlays for LEDs, LCDs, and vacuum fluorescent displays. Unlike conventional overlays that add the window, the windows are the base material for optimum clarity and durability. Overlay panels can incorporate high-resolution graphic images that are digitally printed on the polycarbonate or polyester subsurface. As the quantity and variety of electronic devices in cars continues to grow, Ethernet promises to improve performance and enable increasingly powerful and useful applications in vehicles. 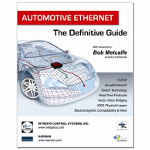 "Automotive Ethernet - The Definitive Guide" describes the fundamentals of networking and explains the Data Link and Physical Layer technologies used by industry-standard Ethernet variants, as well as the new BroadR-Reach technology from Broadcom designed specifically for vehicle use. Offered by Intrepid Control Systems. New PEM Type THFE heavy-duty studs from PennEngineering clinch permanently into thin metal sheets to provide robust fastening solutions and practical alternatives to weld studs for especially demanding applications where high strength attachment may be required. Their enlarged head diameter distributes axial tightening force over a wide area to reduce compressive stress on the host panel, improve pull-through performance, and develop full thread strength. With the latest update of its popular GoTo Products App for iOS and Android devices, Bosch Rexroth now offers convenient mobile access to its broad range of Drive & Control technologies for fast delivery throughout North America (U.S., Canada, and Mexico). The GoTo Products 4.0 app includes all of the latest additions to Rexroth's GoTo Focused Delivery Program, with a powerful sync-on-demand feature that lets users update the app with the latest product offerings at any time, wherever they are. A structure synonymous with NASA's Armstrong Flight Research Center for the past 38 years, the grey-colored space shuttle Mate-Demate Device (MDD) at Edwards Air Force Base in California, is being dismantled and demolished as a part of the final chapter in the U.S. space shuttle program. Researchers at Purdue University have discovered a previously unknown mechanism for wear in metals: a swirling, fluid-like microscopic behavior in one solid piece of metal sliding over another. 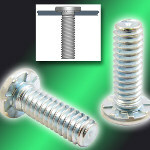 The findings could be used to improve the durability of metal parts in numerous applications. A tabletop motor using an entirely new driving principle is under development at the headquarters of C-Motive Technologies, a startup business that is commercializing technology from the College of Engineering at UW-Madison. The new Objet500 Connex1 and Objet500 Connex2 triple-jetting multi-material printers from Stratasys deliver high-throughput 3D printing while combining multiple materials for prototyping and production tooling. Stratasys triple-jetting technology is designed to allow the user to build products with up to three different materials in a single run, or even mix multiple material droplets to form new digital materials such as tough Digital ABS. Taking a cue from the natural airfoil design of bird wings, the creative wizards at pneumatics specialist Festo have come up with a totally new concept for generating wind power. 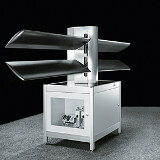 The horizontal DualWingGenerator uses an opposing-wing design to generate electricity and is especially effective at low wind speeds. This video explains the simple mechanical inner workings. A really fresh -- and inspiring -- design.